Learn all about the Hustle! Unlike many other ballroom dances, the origins of the Hustle aren’t buried in the distant past. Many hustle fans can still remember when the dance first swept the country in the mid to late 1970s following the release of the blockbuster film, Saturday Night Fever. As with so many other dance crazes, the hustle began in the dance clubs and party scene of New York City. Dancers in the local Latino community created the dance, infusing the salsa with some swing, mambo, and even tango. The popularity of dance competitions, which attracted many of the city’s best dancers, introduced the hustle to the mainstream, and dancers throughout the country began to introduce variations of the original steps. Line and partner versions of the hustle were developed, with Saturday Night Fever depicting several types of each. Disco fever hit its peak in the middle years of the decade, and the hustle became the dance that defined pop culture for the post-sixties generation. Arthur Murray, a Naperville-based dance school, is part of the internationally renowned Arthur Murray Dance Studios system. 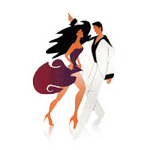 The Naperville franchise teaches hundreds of students each year with lessons in the hustle, rumba, salsa, ballroom, swing dance, cha-cha, and others. To schedule your complimentary first dance lesson, fill out our on-site contact form here.